3. Which layer of the hierarchical three-layer design model combines traffic from multiple IDFs? 4. A network administrator is removing several VLANs from a switch. 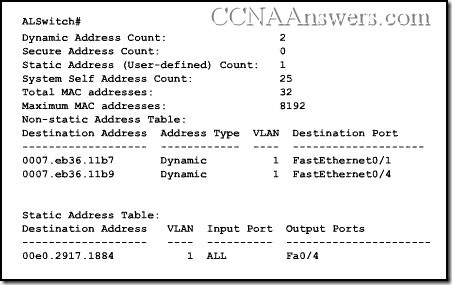 When the administrator enters the no vlan 1 command, an error is received. Why did this command generate an error? Refer to the exhibit. 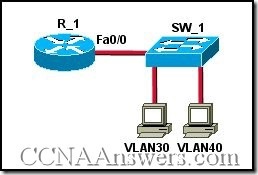 Two Catalyst switches are connected, and both switches have ports configured for VLANs 40 and 50 as shown. 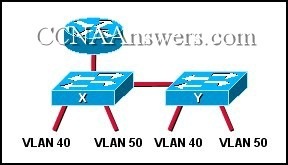 What will allow hosts on the same VLAN to communicate with one another across the different switches? 8. Employees of XYZ Company connect their laptop computers to the office LAN using Ethernet ports. 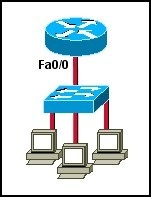 The Cisco switches used in the company network are configured with port security. At which layer of the three-layer design model do these switches operate? RIP v2 must be configured with the network command and the IP host address and subnet mask for the newly activated interface. Refer to the graphic. 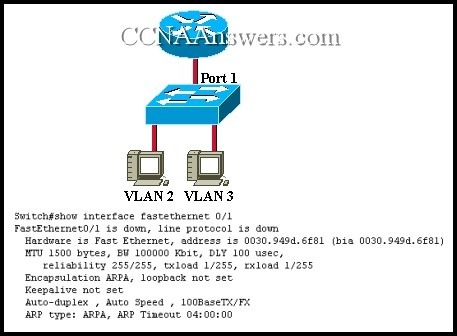 The host on VLAN 2 cannot communicate with the host on VLAN 3. 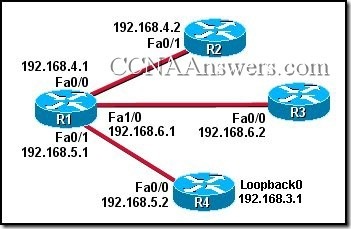 Which of the following could be the problem based on the output of the show interface fastethernet 0/1 command from the switch? 12. What is added to a bridge CAM table as a frame passes through a switch? Refer to the graphic. 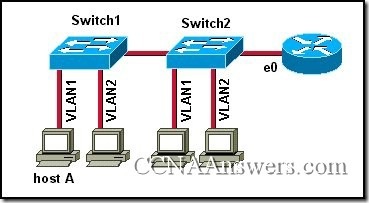 Switch 2 has computers attached that belong to VLAN 2. Switch 3 has computers attached that belong to VLAN 3. 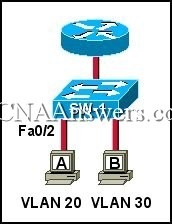 Switch 1 is a Cisco 2926G Layer 3 switch that has a route module installed. 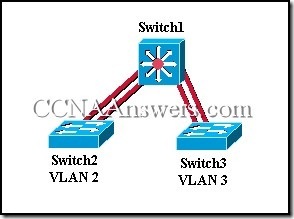 Switch 1 provides connectivity to the other switches and is used to route between the VLANs. 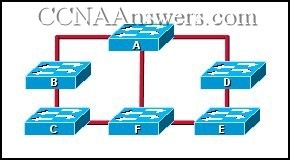 At which layer of the three-layer switch design model does Switch 1 operate? 20. A network administrator is having problems with excessive collisions on the corporate network. If the network currently uses hubs, what is the most cost effective way to reduce collisions? 22. What does a constant green SYSTEM LED indicate on a Catalyst switch? 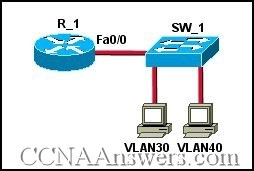 Refer to the OSPF network in the exhibit. Router REMO_2 has been elected DR, but router REMO_1 is the more powerful router. 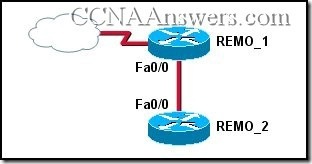 How can the network administrator configure REMO_1 to force it to be elected as DR? 25. 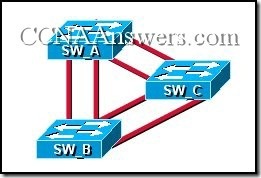 What is the first step in the spanning-tree process? 26. 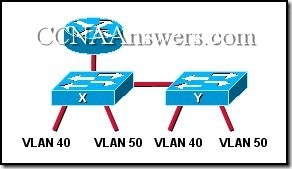 Which of the following statements is true when VTP is configured on a switched network that incorporates VLANs? Refer to the graphic. The network has converged. 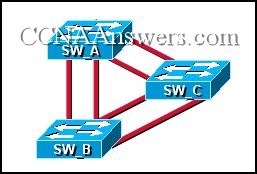 Network traffic analysis indicates that switch A should be the STP root bridge. 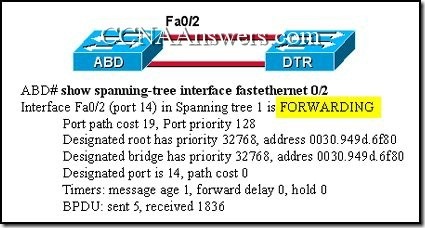 However, switch F has been elected root bridge of the STP tree. 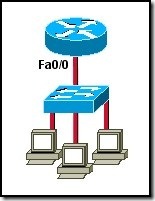 The switches are all set to the default spanning-tree bridge priority value. 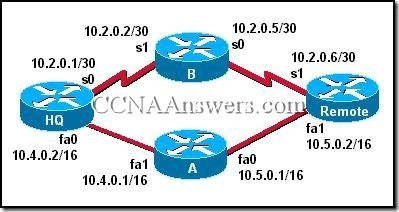 How can the network administrator change the root bridge to switch A? Refer to the exhibit. 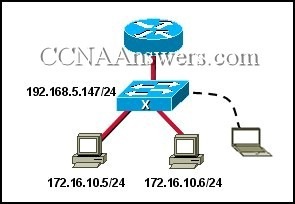 A company always uses the last valid IP address in a subnetwork as the IP address of the router LAN interface. A network administrator is using a laptop to configure switch X with a default gateway. Assuming that the switch IP address is 192.168.5.147/24, what command will the administrator use to assign a default gateway to the switch? Refer to the exhibit. 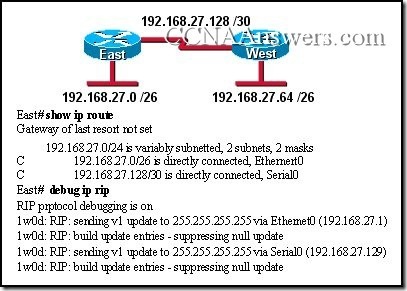 Which configuration commands will direct outbound traffic from RT-2 to the ISP and inbound traffic from the ISP to network 192.0.2.0/27? 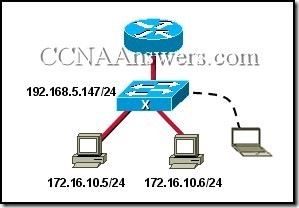 Hosts in the ACCT and ENGR VLANs must have IP addresses in the same subnet in order to exchange data between VLANs. Refer to the graphic. What is the first parameter used to determine which switch is selected as the root bridge in the spanning-tree process? 33. 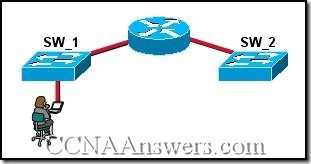 When should EIGRP automatic summarization be turned off? Refer to the exhibit. 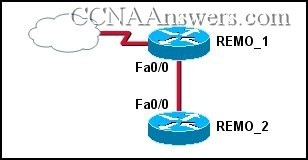 If the network is running RIP v2, which subnetworks can be assigned to the serial links between RTR-2 and the two other routers? 35. 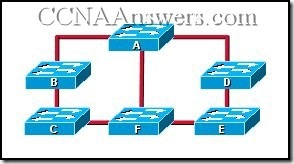 Which switching method increases latency and reliability more than any other method? Refer to the network and command output shown in the exhibit. 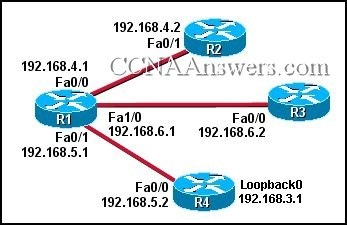 A network administrator located at the Branch1 site needs to check the configuration of a switch located at the Central office. Which command can be used to gain remote access to the Central LAN switch, assuming the switch is assigned the IP address 192.168.10.238/24? Refer to the exhibit. 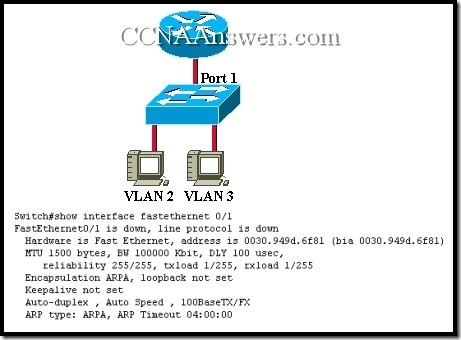 How should an administrator configure the ports on switches ACC-1 and ACC-2 to allow hosts on the same VLAN to communicate across the two switches? Refer to the exhibit. 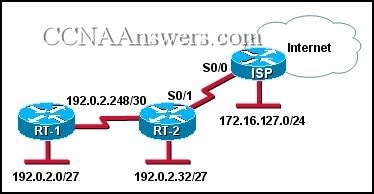 Which set of commands should be used on the router to provide communication between the two hosts connected to the switch? 42. 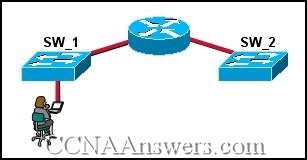 How do EIGRP routers establish and maintain neighbor relationships? Because of their frequent periodic updates, distance vector protocols after convergence use more bandwidth than link-state protocols do. Refer to the exhibit. Routers RT-1 and RT-3 are completely configured. 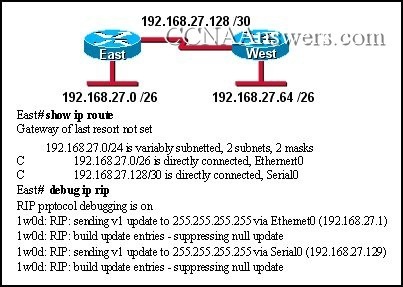 The administrator needs to configure the routing protocol on router RTR-2 so that communication occurs throughout the network. 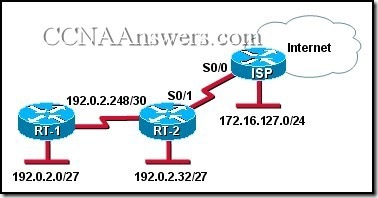 Which group of commands will successfully configure EIGRP on RTR-2? Information about the 198.19.150.0 network learned dynamically will be ignored as long as this configuration command is in effect.